Walking with Jesus: Day 37: Acts 12:1-5 & Prov 15:1-9 - How Should the Church Respond to Violent Persecution? Day 37: Acts 12:1-5 & Prov 15:1-9 - How Should the Church Respond to Violent Persecution? How Should the Church Respond to Violent Persecution? Since the election of Donald J. Trump to the presidency, many Christians are looking for the White House to reverse emerging trends of discrimination and persecution of Christians in America. Small business owners are being compelled to either violate their consciences to participate in events they regard as immoral or face the loss of their businesses and, in some cases, of their retirement accounts and homes. Other Christians have been forced to resign their positions within companies or have seen their television programs forced off the air for holding to biblical convictions on social issues. Such relief has not yet come, and some fear the expansion of executive power that would be required in order for the White House to directly grant such relief. Meanwhile, many of our brothers and sisters around the world face severe and violent persecution for their faith, including the burning of their churches and homes, imprisonment in harsh labor camps and worse. Last year, over 150,000 Christians around the world were killed for their faith. What should we do? 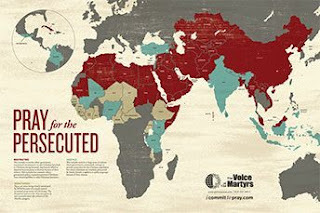 How should we respond to this wide range of persecution? Well, when the Apostle James was killed by King Herod, and then the Apostle Peter was arrested and kept in prison for a time, what did the church do? We do not see them rioting, boycotting, demanding a change of government or staging mass protests. Instead, the church under persecution intensified their prayer life. We so easily overlook the importance of prayer or the vitality of prayer as a spiritual weapon for the advance of the Gospel and the defense of the church. Such a low view of prayer and our quickness to pursue political and civil means for relief show the shallowness of our view of God and our overly exalted view of ourselves. Our lives are in God's hands. We are not our own; we were bought with a price. Christ is the head of His church, which is His body and His bride. The kingdom of God advances according to God's soveriegn will. The Gospel grows and bears fruit as He blesses and protects and provides. John Bunyan said, "You can do more than pray after you’ve prayed, but you cannot do more than pray until you have prayed.” How much stronger would the church be if we really believed this? Heavenly Father, we are indeed in Your hands. Nothing can touch us apart from Your explicit permission in order to serve Your purposes. In the same way, nothing we do can have any eternal value or bring glory to You in any real way without Your blessing of grace. Protect Your church and advance Your Gospel, Lord, we pray, in Jesus' name, Amen. and how much we need You to tame our tongues. and bridle our tongues by Your Spirit that we make speak in wisdom. and we trust You to guide and protect, according to Your perfect will. that we may guide our children in life and prudence. as You impart to us and infuse in us the perfect righteousness of Christ. offered through Jesus Christ, our Great High Priest and perfect sacrifice. that we may not walk in foolishness or wickedness, but keep to Your path.